World Psoriasis Day is an international awareness day observed on October 29. Its main goal is to raise awareness of an autoimmune disease that affects millions of people all over the world, as well as to combat stigma associated with it. Psoriasis is a chronic skin disease characterized by patches of red or purple, dry, itchy, and scaly skin. There are five main types of psoriasis, with plaque psoriasis being the most common form that affects about 90% people suffering from the disease. People with psoriasis often experience significant physical and psychological discomfort. Sometimes psoriasis is accompanied by psoriatic arthritis (painful inflammation of the joints and surrounding connective tissue). Contrary to common misconception, psoriasis is a non-contagious disease. It is generally believed to be a genetic disease triggered by environmental factors. Although there is no cure for psoriasis, there are various treatments that help control symptoms and improve the quality of life of individuals with psoriasis. 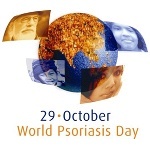 World Psoriasis Day was established in 2004 by the International Federation of Psoriasis Associations (IFPA). Its main aims are to raise awareness of psoriasis as a condition that affects over 125 million people, spread information about psoriasis and dispel common myths, and give people with psoriasis and/or psoriatic arthritis access to affordable treatment.